The Rijksmuseum is a Dutch national museum dedicated to arts and history. The Rijksmuseum also contains an Asian section, with Japanese prints, Chinese porcelain pieces, and other historical articles. The museum is located at the Museum Square in the borough Amsterdam South. The largest art history research library in the Netherlands is part of the Rijksmuseum, called the Rijksmuseum Research Library. Those who cannot visit the Rijksmuseum can view more than 125,000 pieces of its collection online. It was formally established by decree of the King of Netherlands Louis Bonaparte in 1808. Louis Bonaparte was Napoleon Bonaparte’s brother. The current main building was designed by the Dutch architect Pierre Cuypers and first opened its doors in 1885. It has been built in the then fashionable Dutch neo-Renaissance style, using historical neo-Gothic elements in it form and decoration. The Rijksmuseum contains 80 rooms, and 1.5 km of walking space. On 13 April 2013, after a ten-year renovation which cost € 375 million, the main building was reopened by Queen Beatrix. Total building size is 30,000 square meters (323,000 square feet). Total exhibition space is 12,000 square meters (130,000 square feet). The same museological designer responsible for the Louvre's interior design was hired to do the Rijksmuseum's interior as well when it underwent its renovation. His name is Jean-Michel Wilmotte and he also worked on many other famous buildings and projects. The museum is laid out over four floors, labelled from zero to three. The walking distance through the museum’s 80 galleries is a total of approximately 1.5 kilometers (0.9 miles). The Rijksmuseum's main building closed on December 7th, 2003, and did not reopen until April 13th, 2013. 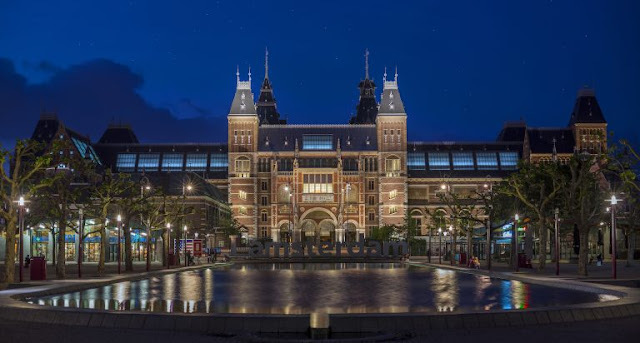 It underwent renovations and after reopening more than 2 million people visited the Rijksmuseum in only 8 months. The collection of the Rijksmuseum consists of 1 million objects and is dedicated to arts, crafts, and history from the years 1200 to 2000. Around 8000 objects are currently on display in the museum. The collection contains more than 2,000 paintings from the Dutch Golden Age by notable painters such as Jacob van Ruisdael, Frans Hals, Johannes Vermeer, Jan Steen, Rembrandt, and Rembrandt’s pupils. Rembrandt's famous piece "The Night Watch" is on display at the Rijksmuseum. "The Jewish Bride", another of his famous works, is also on display at the museum. The Night Watch, a 1642 painting by Rembrandt van Rijn. It is prominently displayed in the Rijksmuseum as the best known painting in its collection. The Night Watch is one of the most famous Dutch Golden Age paintings. The stern of the HMS Royal Charles (three-decker ship built in 1655) is on display at the Rijksmuseum. The Milkmaid is an oil-on-canvas painting of a “milkmaid”, in fact a domestic kitchen maid, by the Dutch artist Johannes Vermeer. The exact year of the painting’s completion is unknown, with estimates varying by source. The Rijksmuseum estimates it as circa 1658. The Rijksmuseum has more than 2000 paintings, including work by Rembrandt and his students. Construction of the Rijksmuseum began in 1876 and it opened in 1885. Marriage Portrait of Isaac Massa and Beatrix van der Laen is a painting by the Dutch Golden Age painter Frans Hals, painted in 1622. The Rijksmuseum houses one million objects. Approximately 8000 are on display at any given time. The Threatened Swan is an oil painting of a swan made around 1650 by Dutch Golden Age painter Jan Asselijn. The painting’s subject is a life-size swan (Cygnus olor) defending its nest against a dog. In 1876 another contest for the design of the proposed museum was held. The second place winner of the first contest won the second contest. His name was Pierre Cuypers. Winter Landscape with Skaters is a 1608 oil on oak painting by the Dutch artist Hendrick Avercamp. This painting shows ice skaters of all sorts enjoying a day on a frozen river. In 1863 a contest was held for the design of the new museum to be called the Rijksmuseum. None of the submissions were considered to be suitable, despite judging the entrees and establishing winners. In 1817 the Royal Museum moved to Trippenhuis, but this location was unsuitable for the growing collection and in 1820 many historical pieces were moved to The Hague's Mauritshuis. It also displays the stern of HMS Royal Charles (three-decker ship built in 1655) which was captured in the Raid on the Medway. In 1809 the Royal Palace became home to the Royal Museum, in Amsterdam. The decade-long renovation cost €375 million to complete. Queen Beatrix reopened the main building in 2013. The Royal Museum, and later the Rijksmuseum, was established to celebrate and display Dutch history. The Rijksmuseum has a large, outdoor public space for visitors, in the form of a 14,500-square-meter (156,000 square feet) historic garden. Rijksmuseum first opened in 1800 but it was formally established by decree of the King of Netherlands Louis Bonaparte in 1808. It was originally known as the Royal Museum. In 2012 the museum took the unusual step of making some 125,000 high-resolution images available for download via its Rijksstudio webplatform, with plans to add another 40,000 images per year until the entire collection of one million works is available, according to Taco Dibbits, director of collections. In 2016, it was the most visited museum in the Netherlands with 2.2 million visitors. It is also the largest art museum in the country. The Rijksmuseum is a rijksmonument (national heritage site) since 1970 and was listed in the Top 100 Dutch heritage sites in 1990.